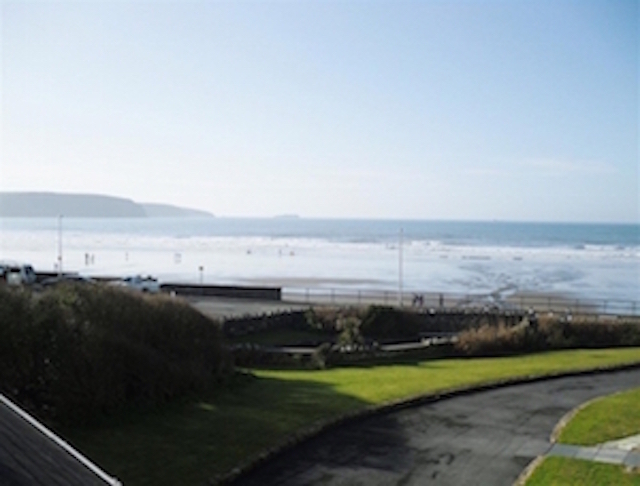 Enjoying a great location literally a stones throw from the sea, this comfortable ground floor coach house apartment in the heart of Broad Haven makes an excellent holiday destination in Pembrokeshire. Kitchen: Equipped to a very good standard includes oven, hob, extractor fan, microwave and fridge. There is a good range of kitchen equipment. Lounge: Is comfortable with 2 sofas, TV and DVD/Blueray player. There is also a bluetooth facility to play music from your own device. Bedrooms: Bedroom 1:1 x double bed and bedroom 2: twin beds. (Travel cot provided but please bring own cot bedding). Bed Linen: All bed linen and tea towels are provided. Towels can be hired at £4 per set of 1 x bath and 1 x hand if required. Bathroom: There is a bath with a shower over, wc and sink with a mirror and shaving point. Heating: The apartment is heated by gas fired central heating. Please note that there is no washing machine in 1 Coach House but there is a laundrette on Broad Haven Caravan Park in the village and Stay in The Havens also offer a chargable 24 hour turn around laundy service. Outside there is private parking on the Coach House car park. We really enjoy this cottage. It has everything for a couple, with dogs. Conveniently located shop, beach and pub within 50 metres and good sea views. We’ll definitely book again. I can highly recommend No 1 The Coach House. The accommodation was spacious, comfortable, well equipped and homely. The beach at Broadhaven is beautiful and the walk to Littlehaven is a must. We also visited Whitesands which is also very picturesque. Unfortunately, we were very unlucky with the weather during our stay but I will certainly be returning again next year. I can highly recommend No 1 The Coach House. The accommodation was spacious, comfortable, well equipped and homely. The beach at Broad Haven is beautiful and the walk to Little Haven is a must. We also visited Whitesands which is also very picturesque. Unfortunately, we were very unlucky with the weather during our stay but I will certainly be returning again next year. Lovely apartment great location Heating a big plus out of season Plenty of places to eat out and a great area for walks on beach or coastal path. Would like to say we had another enjoyable stay at this apartment. The weather wasn’t too kind to us but we were warm and cosy. The coach house is clean, well equipped for purpose and welcoming. Love the location and will be visiting again. A really nice well maintained comfortable place to stay in Broad Haven. Everything was very easy with the booking and when we arrived it really felt like we had our own place to relax and enjoy our few days we had. Decor was very nice and had a nautical feel that represents the area. Place was clean and tidy with nice beds, open kitchen area and lounge with HD tv and dvds provided. Ideal for couples. Located just a few yards from the beach it made it ideal for our walks we had and with the shop and pub just few minutes away too. A bonus is was a view of the sea and able to see the ships moored in St Ives bay. Was very relaxing. We will return again soon. 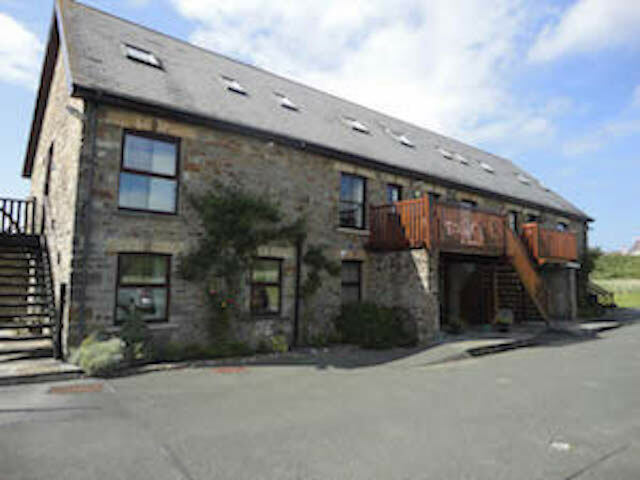 We really enjoyed our time at number 1 the coach house, the accommodation was good and everything was clean and tidy. For access, the coach house was ideal as the beach was just literally 2 minutes away and so convenient for the Pub and shop which were next door. Hope to be back next year. The Coach House is in a fantastic location, metres away from the gorgeous beach. The apartment was immaculately presented for our arrival and had everything you could possibly need. Beautiful views through the window especially the glorious sunsets. Will definitely be coming back to the Coach House! We were very happy to stay in 1 Coach House and to enjoy its excellent facilities and we hope to visit again in the very near future. It is a wonderful house, good position and convenient to travel to other places by bus, e.g. St. Davis and Skomer Island. My wife and daughter both love the house. Every day we walk on the beach. When the low tide, you can walk to little haven from the beach. We are planning to visit next year and hope to stay longer. Thanks. It was such a pleasure to stay at 1 the Coach House, it was a fabulous little place with all the facilities needed and so close to the beach! I would definitely look to book it again if coming over that way! We had a wonderful time thank you, the coach house was faultless and luckily the weather was much better than originally forecast. This is our third visit as we find 1 Coach House both comfortable and well equipped. It is tastefully furnished and well maintained. It’s position just across the road from the beach and close to the local shop and other facilities is perfect. A lovely cottage in a beautiful place. We really enjoyed our stay at the coach house the apartment was ideally situated just yards from the beach and the pub! Clean and comfortable with everything you could need for a great holiday. Thank you. I can genuinely say yet another great stay in the Havens. We love the location and it’s great for dogs ( and us)! A clean, comfortable and well equipped apartment. Great view of the sea especially during storm Brian. We will be visiting again. We had a fantastic study thank you a perfect location to base ourselves for the area. We surf and it was perfect. We will definitely be back with you again next year if not sooner! Thank you the accommodation was just perfect for us. Many thanks for your contact and making it an easy enjoyable stay. We had a fantastic time yet again. Apartment is perfectly located for the beach. We visited St Davids, went crabbing at the harbour in Solva which was good fun. We will be back hopefully next year. We had a lovely stay again. Brilliant location especially for my 86 year old mum, who managed to get about on promenade and local Boardwalk too - as all on one level. Comfy beds and everything you need. Had another great stay in this lovely cottage and the weather was great! Love the flat had a lovely week. We hope to be back again early next year. We booked very last minute and are delighted we did. Cozy, comfortable and clean accommodation well equipped, great location. Lovely dog-friendly beach and pub stones throw away as well as Londis shop. Lovely walks doggie heaven and the most beautiful sunset I have ever seen. We hope to return soon. Thank you Karen very much x. Brilliant base for coming back to after the beach, so close! Comfy and cozy apartment. We enjoyed the week very much. We all had a wonderful week very pleased with this lovely cottage as it is in a fabulous location and ticked all the boxes for us. Lovely cottage, excellent location next to the beach. absolutely loved out stay at 1 Coach House, fantastic location (enjoyed beautiful sunsets every evening) excellent facilities, very comfortable, homely and baby friendly!! We definitely hope to return - Thank you very much and see you again soon! What a fabulous transformation - stunning!! Had a lovely relaxing break and can't wait to come back again. Lovely apartment. Fab views, very clean as are all the properties and we had amazing weather and fab sunsets. Thank you until next time. Many thanks for the help you gave me in booking, Karen. Thank you for a wonderful apartment, very clean, very warm, couldn't fault any of it. Will be back to stay with Stay in The Havens. All in all relaxing break by the sea. Ta! This is a lovely location and we had a great time on the beach. The Apartment is good in many respects but as mentioned previously, TV reception was really patchy.The welcome pack was a nice touch and we've had a good stay. NB from Karen - The TV has now been replaced with a flat screen Freeview TV and the aerial has been updated. Lovely location and a well-equipped kitchen! We had three (!) weeks to go but still doesn't feel like enough...what a lovely place, especially with kids!! Just please add a washing machine!! We have been able to have a wonderful week, especially as the weather didn't start off well. Managed to visit a few places. St Davids is definitely worth a visit, Picton Castle and gardens are worth it if only half day. Cycling round the reservoir was a challenge but a great feeling to have accomplished it! Eva's Bistro was disappointing as wasn't able to take more than 2 couples at a time but a lovely place to eat is the Nest Bistro in Little Haven, lovely walk there too - would highly recommend it! The coastal walks are amazing especially if you enjoy scenery! A little tip if you would like to go to Skomer, make it an early start as boat gets booked "very" early, this will save disappointment! The cottage is well equipped and was good accommodation for what we needed this week! Good apartment and location. Luckily we got to see some puffins at the beginning of the week by jet boat from St Davids. After that nothing put to sea due to the weather. What a lovely find this apartment is, ideal location and everything you need for a holiday. Found plenty to do - saw porpoise and seal at Strumble Head, an otter at Bosherston Ponds. Lots of lovely beaches. Would advise ringing if going to Skomer as long windy roads to get to and find boats can't go - also rang at 8am and got there at 9.15am all sailings totally booked, not complaining will just have to come again to see the puffins etc. Weather has been great apart from Bank Holiday Monday when rained all day. Looking forward to a return visit. Thank you. We have had an amazing few days her in Broad Haven. The accommodation is very clean and has everything you need. An excellent base for touring. The beach is fantastic - our 5 year old was in heaven. The weather was beautiful. The Ocean for food very good. We will be back! We booked this holiday cottage last minute and what a result! 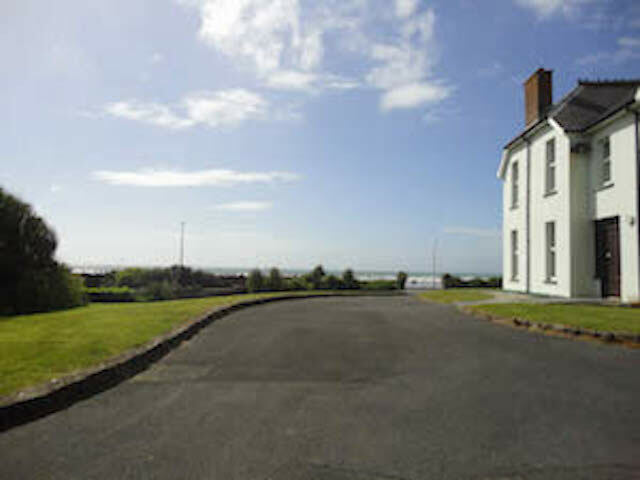 Excellent location with great views of the beach, sea and amazing sunsets. We have walked to the right along the coastal path to Newgale; to the left and St Brides; and a short walk to Haroldston through the woods. We took a drive to Milford Haven to see where the oil tankers dock and there is an interesting museum in the Marina - only £2 entrance fee - well worth it. We ate at the Galleon and it was pleasantly surprised at the quantity and quality of the food. The Ocean was more expensive but lovely food, surroundings and service. We have had a lovely week - even the rain held off for most of it! Good, clean and comfortable apartment. Many thanks for the milk and welcome basket, it was good to have a cuppa when we arrived. We enjoyed walking the coastal path, beach activities on Broad Haven and just relaxing. Hope to see you again. Thank you. Fab week. Amazing weather and flat.